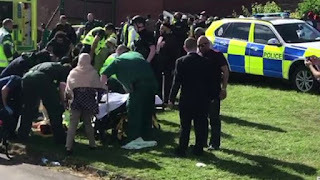 Six people, including three children, were injured when a car mounted a kerb and ploughed into a crowd of people outside a sports centre in Newcastle. It happened at about 09:14 BST outside Westgate Sports Centre where an event was taking place to celebrate Eid. One of the children is said to have been critically injured. Northumbria Police said the incident was not believed to be terrorism-related. A 42-year-old woman was arrested and is in custody, police said. No-one else was being sought and extra patrols were in the area to reassure communities, police said. Hundreds of people were at the event to mark the end of Ramadan. One eyewitness said: "From what I understand, [a woman who had been at prayer] was about to leave in her car and I believe she lost control. "I ran up straight away because everyone was moving in on all the injured, trying to put water in their mouths. "The parents of the kids were there, I had to sort of try and calm them down just to tell them the ambulance is there and they will take care of it; they know what they're doing. "It caused a lot of panic; everyone was screaming when it happened, it wasn't the best of experiences." A North East Ambulance Service spokesman said: "We received our first 999 call at 9.15 this morning to report a car that had mounted the kerb. "We have taken six people to hospital; they have gone to the Royal Victoria Infirmary in Newcastle; three children and three adults." Emergency services included six ambulances, two paramedic rapid response vehicles and the air ambulance. Chi Onwurah, Labour MP for Newcastle Central, tweeted: "So sad, I was at the prayers earlier & there were so much joy & unity. Thinking of those affected by what I am told was terrible accident."